To publish a directory of contacts to your members, or to the visitors of your website use the “directory” tab of the “setting” menu. 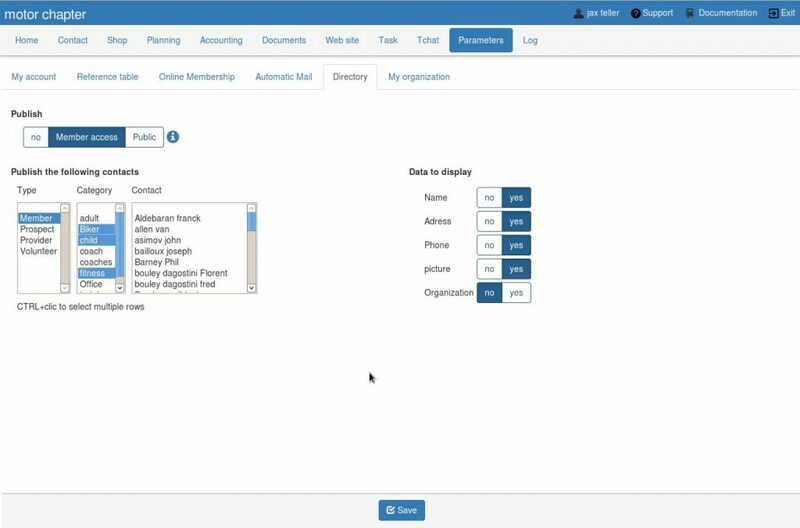 The interface allows you to define which contacts to display in the directory and what information is to be made available to the users. The privacy of the directory can be set to “personal space” so that it is accessible only to people identified and connected to their personal space, or “public” if you want to disseminate information on your website for example . If the setting is “public” the software will tell you which URL is to be used to broadcast this information. In the case of the website that we propose you with your subscription, you must integrate the tag below by taking again the url indicated.